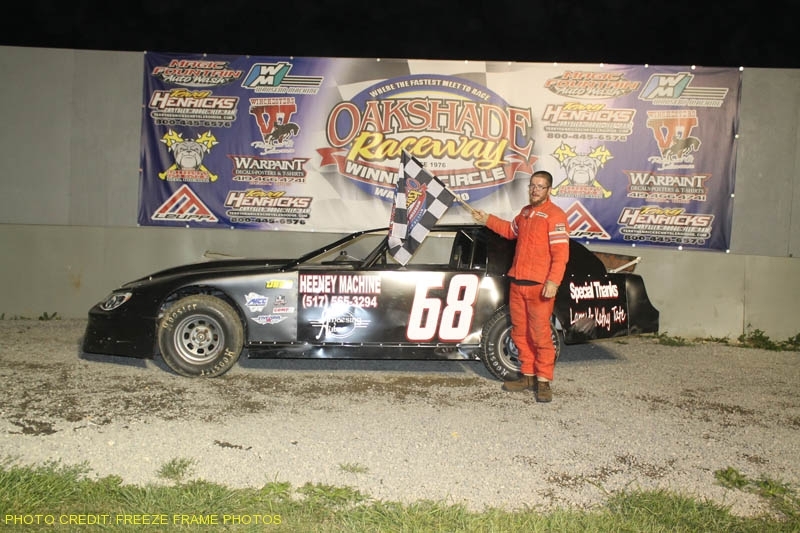 Saturday night was Evergreen FFA/Alumni Night at Oakshade Raceway in which defending Oakshade Raceway UMP Late Model track champion Devin Shiels found his way to victory lane for the first time in 2018. The win increased his lead in a very tight point battle going into the final stretch of races. Shiels, out of Britton, Michigan, stared on the outside of the front row and led the entire distance. Other than a yellow for a big wreck on the initial start, the race ran 25-laps caution-free which made for a lot of lapped traffic. Steve Kester was running second and tried to fend off Ryan Missler to no avail. Missler was a straightaway behind Shiels when he assumed the second position. Missler was unable to close up much on the race leader despite the heavy lapped traffic. Shiels was back in championship form, picking up the win after lapping more than half the field. 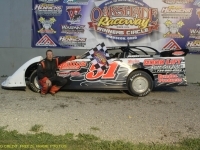 Missler had to settle for a second place finish with Kester hanging on to finish third ahead of Casey Noonan and Brad Wade. The gap between Shiels and Kester in the point standings may have increase, but it is still close at only 28 points separating the two drivers. Missler is third, 99 points behind Shiels with just five point events left this season. Garrett McClain and Tim Fisher put on a good battle for the lead early in the AmeriGas UMP Sportsman feature. McClain led the first three laps until Fisher got by on lap four. 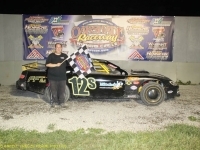 Tecumseh, Michigan’s Mathew Chapman had things working on the high side and took the lead from Fisher on lap 12 and then pulled away for his fourth win of the year. Point leader Mike Jessen finished second followed by a hard charging Drew Smith. Fisher slipped back to finish fourth with Rusty Smith fifth. The top three in points (Mike Jessen, Rusty Smith and Mathew Chapman) are all separated by less than 30 points. 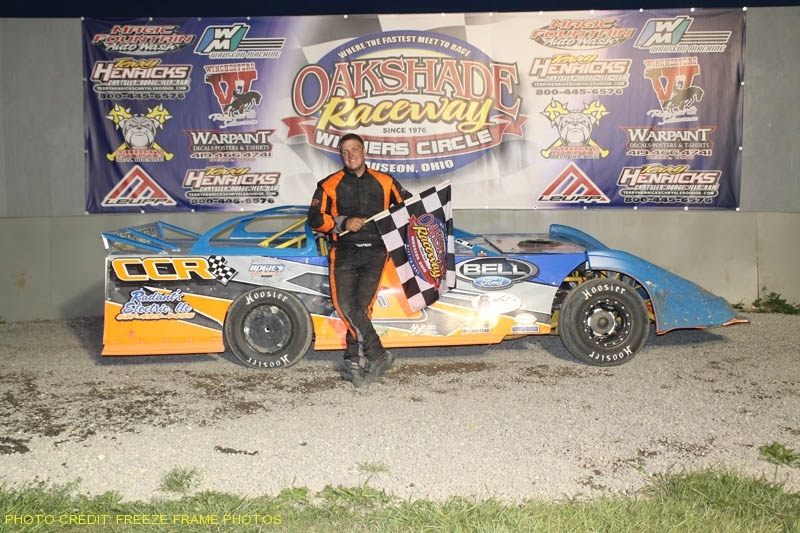 Familiar faces were battling at the front of the Hot Rod Welding & Engineering Bomber A Main once again this week. Chris Henry took the lead at the start with Jeff Foks Jr. hot on his tail. That was the case until a spin just in front of the leaders caused Foks to lock it up and spin to avoid the car that had spun in front of them. Henry was able to get by without incident, but since Foks stopped on the track he was forced to restart at the back of the field. 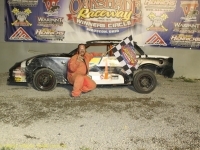 Henry went on to capture an incredible sixth Hot Rod Welding & Engineering Bomber A Main win in a row. Adam Noonan made up some ground in the points with a second place finish. Noonan is second in points, 31 behind Foks who remains atop the standings despite posting a disappointing 12th place finish. 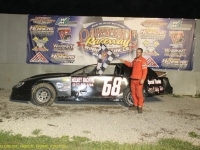 Rich Riffe, Terry Rushlow and Ryder Price were the rest of the top five finishers. A lengthy red flag period interrupted the Compact feature event after a scary incident involving Paul Miller. Miller had to be extricated from his car and Life Flight attempted to land at the track. After an aborted landing by Life Flight because of the dust, Miller was transported away by ambulance. 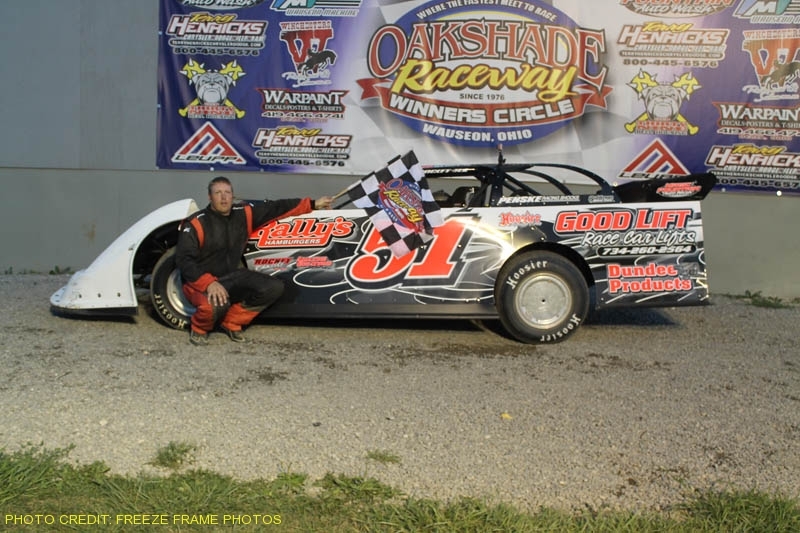 As of Sunday morning, Miller was sore and would be released from the hospital soon and would be ready to race next weekend according to a Tweet from Oakshade Raceway. 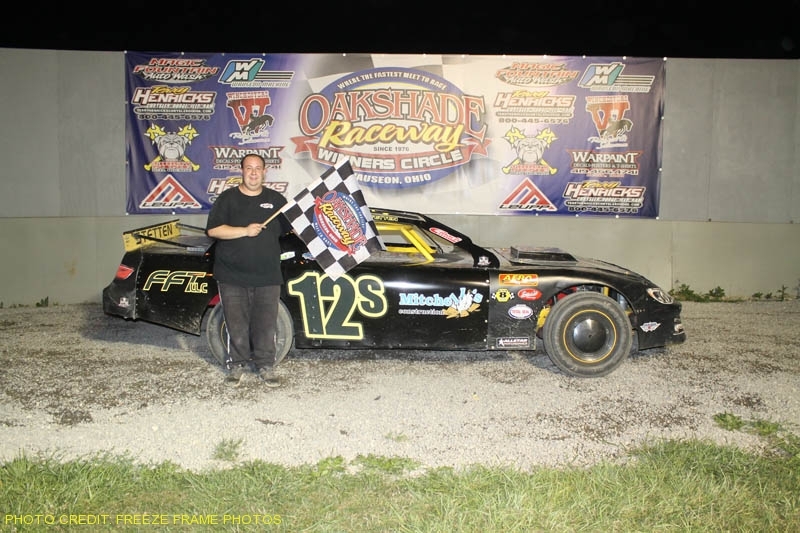 After a delay of just over an hour, the final laps of the Compact feature were completed with Nathan Goodman from Wauseon, Ohio, posting his second consecutive feature win. Ken Watts took second followed by Jason Deshler and Devin Goodman who started deep in the field. 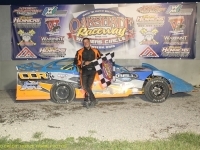 Compact point leader Eric Carr ended up finishing fifth. Adrian, Michigan’s Cody Stetten started on the pole of the final race of the night, the Hot Rod Welding & Engineering Bomber B Main, and went on to lead the entire distance. Scott Barnhart made and attempt to get to the inside of Stetten going into turn one and ended up spinning out to bring out the caution and sent him to the rear for the restart. Stetten went on to pick up the win with Scott Hammer finishing in the second position. Shane Estes, Bill Reeves Sr. and Dave McMannamy were the rest of the top five finishers. 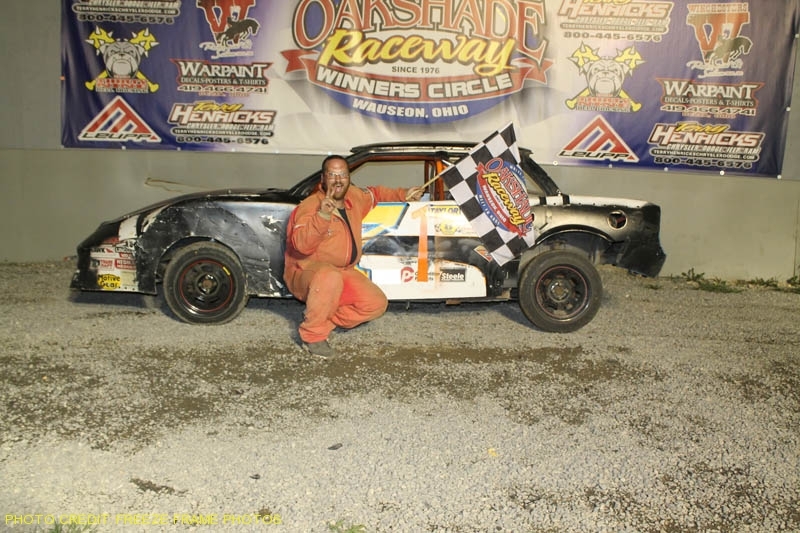 Saturday, August 11th will be AmeriGas Night feature a full show of UMP Late Models, AmeriGas UMP Sportsman, Hot Rod Welding & Engineering Bombers and Compacts. Gates open at 4pm, hot laps at 6pm and racing at 7pm.